The American Cream Shower Gel first became available as a limited edition, Lush Kitchen exclusive last year (2018). I’m not a huge fan of the American Cream scent, I have tried the hair conditioner equivalent but it isn’t suited to my hair as it’s quite a heavy product. Apart from the conditioner I hadn’t really ever used anything else from its scent family until I got this shower gel. Being honest as always, the American Cream scent has always reminded me of one of those car-air-fresheners making it a fragrance that hasn’t ever really appealed to me. I decided to however give the American Cream shower gel a go as it’s ridiculously popular within the Lush community. While I still believe that the American Cream scent is one of Lush’s most overrated scent families it isn’t unpleasant. As I said earlier, the American Cream scent is hugely popular within the Lush community and the shower gel went down a storm when it was first released by the Lush Kitchen in 2018. It was so well received by the community that Lush decided to bring it back as a part of their 2019 Valentine’s Day line. The American Cream shower gel is a dusty shade of pink and as shower gels go is actually the perfect consistency, not to thick and not too thin. Containing vanilla, lavender and fresh strawberry juice American Cream has a gentle, fruity-fresh fragrance, many describe it as smelling just like fresh strawberries and cream. I can see what they mean but to me it’s still smells a little too artificial for my liking. As I said above, I actually really like the consistency of the American Cream shower gel, it takes a little longer than I’m used to, to work up a good lather but once it gets going it’s an excellent shower gel. A little goes quite a long way and it leaves my skin clean, smooth and hydrated too. At the time of writing this review the American Cream scent still isn’t a favourite of mine BUT it’s a light enough fragrance for me to use every now and again. That’s not to say that one day I could have a complete change of heart; Before now many Lush scents have grown on me overtime. The, The Comforter shower creams scent being one of them! Although I wouldn’t personally go out of my way to get another bottle of the American Cream shower gel I can appreciate why it is so popular. Now that the Mother’s Day and Easter 2019 ranges have been released I wanted to mention how disappointed I am to not see any other shower gels in either line. Not great if you’re on the fence about American Cream shower gel like me, I’d have loved a couple more shower gels to choose from. As soon as I heard that the Avocado Wash Shower Gel was a part of this years Lush Valentine’s Day range I ordered the biggest bottle available. I hate to give the game away so early on in a review but this shower gel is quite simply, gorgeous! When the shower gel first came out as a Kitchen exclusive last year (2018) I only ordered one bottle and after first use I instantly regretted not ordering several more. I left my one and only bottle of Avocado Wash shower gel on my bathroom shelf; BIGGEST MISTAKE EVER. The second time I grabbed it ready to use I was horrified to discover that the shower gel bottle was half empty. I had only used it once so knew exactly who to blame for its sudden and rapid disappearance – my husband. He is a glass half full kind of person whereas I am a glass half empty one. I was not impressed. Luckily a few days later more of the shower gels became available on the Lush website, my husband ordered 3 more bottles to say sorry for being so selfish and greedy. I forgave him but am still a little bit mad that he’d used up half of a bottle over just 3 showers, it’s such a waste of product. I’m known to over indulge with Lush but my husband took it to the next level! I want to warn everyone about this shower gels addictiveness, a little of this shower gel does in fact go a very long way and there really is no reason other than being driven completely crazy by its irresistible scent, to use as much as my husband did in such a short space of time. The Avocado Wash shower gel shares its scent with the Avocado Co-Wash shampoo and conditioner. Its scent has always been one that I have liked but unfortunately the shampoo and conditioner doesn’t suit my hair so I only ever tried it the one time. I was therefore over the moon at the prospect of a shower gel equivalent. The Avocado Wash shower gel contains copious amounts of fresh avocado, uplifting bergamot, refreshing litsea cubeba and the comforting olibanum oil too. It’s the perfect blend of ingredients if you’re running a little low on energy or sass, there is just something so rejuvenating about it. Its scent is one of the most refreshing and awakening fruity scents Lush have made and I’m so excited that they’ve recently released several more Avocado Wash scented products that I will be reviewing very soon. Consistency wise the Avocado Wash shower gel is a little runny but this isn’t a negative aspect at all, I actually prefer the runnier shower gels in comparison to the thicker ones. As I mentioned earlier, a little of this shower gel does go a very long way. This makes it excellent value for money (unless you live with my husband of course). The one thing I do recommend that you do before using the Avocado Wash shower gel is giving it a good shake, like the, The Olive Branch shower gel its ingredients separate when left for too long. This is completely normal but is often mistaken as a sign of the product being out of date. In fact Avocado Wash shower gel is self-preserving so quite the opposite! I find Avocado Wash shower gel incredibly hydrating, it leaves my skin silky smooth, bright and revitalised. Its scent can also be smelt on my skin long after using it which is a huge plus for me. It would have been a crime to leave this shower gel as only a Lush Kitchen exclusive, I’m so glad that it’s become available again even if it is only for Valentine’s. Lush’s brand new Cinders Shower Gel had me very excited as it supposedly shares its scent with a product of the same name, the Cinders bath bomb. Although I feel it isn’t exactly the same, their scents are close enough to each other to satisfy my nose. The Cinders bath bomb hasn’t been a part of Lush’s Winter line for a good few years now but I haven’t ever forgotten it. The Cinders shower gel is a gloriously bright orange, it’s a little runnier than I expected but its scent is super similar to the bath bomb. Thanks to its magical cinnamon ingredient, showering with it is like having thousands of tiny hands deeply massaging your tired and aching muscles. As I said earlier, Cinders shower gel is a little runny, this isn’t a negative point at all. A small amount goes a very long way and I find it also lathers up quickly and with ease, especially when compared to super-thick shower gel and creams such as Bubbly or Ectoplasm. My skin feels very clean after using it. Cinnamon isn’t Cinders only magical ingredient either, packed with a generous helping of aloe vera, it is also incredibly hydrating for your skin. Cinders also contains a long list of other warming ingredients such as paprika, ginger powder and nutmeg. Its scent is not as in your face Christmas as the, The Magic of Christmas reusable bubble bar but it’s equally as yummy! Pumpkin seed oil is also found in Cinders, all of these carefully selected ingredients make for an amazingly stimulating and hydrating shower gel. Any Lush product with cinnamon in always has a lasting effect on me. Cinnamon is a wonderful spice, I suffer with chronic pain and it is really good at soothing aching muscles, its warming effects stimulate blood circulation too. Cinders shower gel is a game changer for me. I miss the bath bomb equivalent terribly BUT the shower gel is so much better as it’s not a one trick pony and is incredibly versatile. I’ve used it on my body in the shower and have also dribbled some into a running bath for some musky-sweet and spicy bubbles. As if we needed yet another Lush product that smells good enough to eat! Cinders is definitely my favourite of the shower gels this year, there wasn’t a huge collection to choose from which was a little disappointing but both Sleepy and Cinders have impressed me enough to warrant buying an extra bottle for my shower gel stash. The Sleepy Shower Gel is yet another product that is a member of the Lush-Scent-Family, Twilight. The Twilight scent is one of Lush’s most popular and it has been adapted into so many product formats over the years that it’s hard to keep track of them all. Just to confuse us, Lush sometimes bring out a product that shares a scent with another BUT names it something completely different. ‘Sleepy’ is another branch of Twilight scented products, alongside this new shower gel Lush also have a Sleepy body lotion and a Sleepy shower bomb too. The Twilight bath bomb was my very first experience of the Twilight/Sleepy scent. Sleepy shower gel like all of the other Twilight scented products contain lavender and tonka absolute, making it one of the most relaxing blends of soothing ingredients currently available. It’s perfect to use just before bed, hence the name ‘Sleepy’. As an insomniac anything with ‘Sleep’ in its name will always appeal to me. On scent alone, if I was blind folded and asked to identify which shower gel was which out of Twilight and Sleepy, I don’t think I would be able to tell the difference. Scent wise both formulas are both just as ‘Twilight’ as the other, what sets the 2 apart is the fact Sleepy shower gel has an additional ingredient of oat milk. The oat milk is what gives Sleepy the creamy consistency and complexion. I suspect Lush didn’t name Sleepy a shower cream because people would have compared it to Oaty Creamy Dreamy too much. Even though Lush have called Sleepy a shower gel, in my eyes it’s more of a shower cream. Sleepy shower gel lathers up easily and a little of it goes a very long way too. This is something I always like in a shower gel, after all who doesn’t like getting more for their money? Colour wise the gel is (according to Lush’s website) meant to be a very pale shade of purple, I think it looks more grey though. Once out of the bottle its shade does appear brighter with a slight hint of lilac, once lathered up it however goes back to appearing very grey. Not that its colour hinders its quality at all! Is the Sleepy shower gel better on my skin in comparison to Twilight shower gel? Yes and no. If you look at it from a scent perspective then I can’t see a difference in the two, I would however say that Sleepy is much more soothing on the skin, the lavender and oat milk are a magical pairing of ingredients especially if you have very dry skin like me. The mad Christmas rush has officially frazzled my brain, today I have been sorting the mini mountain of Christmas cards. It was therefore no surprise when I accidently started this review with ‘Dear Berry Berry Christmas…’ *sigh*. Back in September I decided to leave all of the reviews for the Lush products with ‘Christmas’ or ‘Santa’ in their name for December, I thought this was a great idea until I got to December and realised that a lot of the products I had left to review all share a scent. Please forgive me if my blog reviews are a bit repetitive over the next week or so! 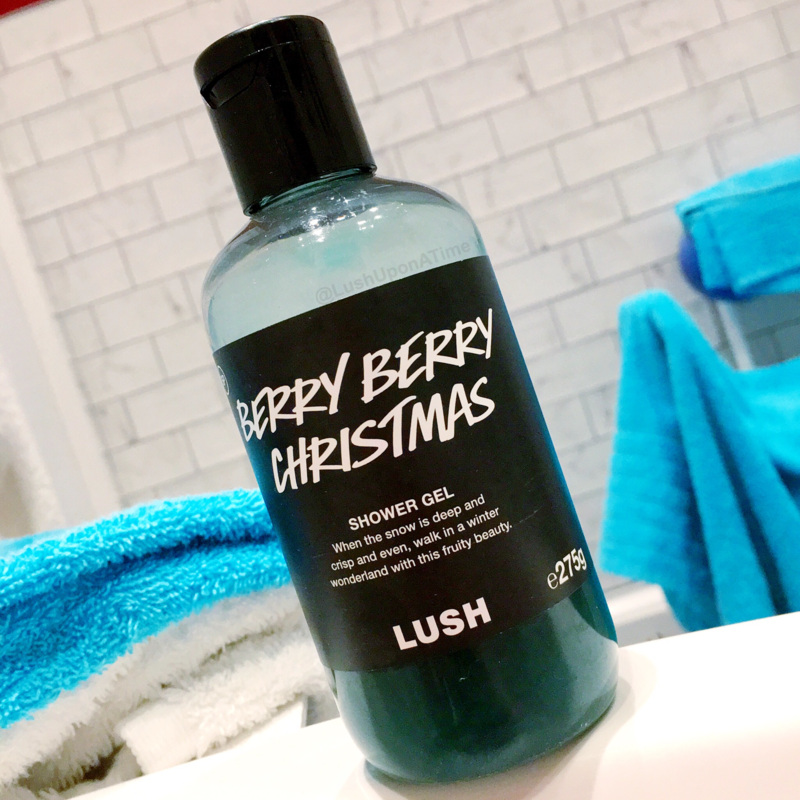 The Berry Berry Christmas Shower Gel is probably my favourite of the new shower gel/creams that are brand new to Lush this year (2017). There has been quite a few newbies but Berry Berry is the one that stands out the most to me. Consistency wise it reminds me of the Bubbly shower gel, thick yet silky smooth. Decorated with a pinch of natural shimmer the Berry Berry shower gel is also super pretty to look at, I love when the sun catches it, it beams of Christmas magic. Its green colour and sparkly bits make me think of big, twinkling Christmas trees. Upon first sniff I thought that Berry Berry was very alike the Plum Rain shower gel, it however doesn’t share many ingredients with it at all, this left me very confused. Some people have agreed with me comparing it to Plum Rain whereas others have said it’s nothing alike. It’s so peculiar how the same scents can smell so different to others, I guess that is what makes Lush so moreish though! Once you begin to lather the Berry Berry Christmas shower gel in your hands you are hit with a fragrance-wave of blueberry, it is at this point that you realise Berry Berry is a lot more crisp than the Plum Rain scent, a quick whiff wakes me up just as well as the avobath bath bomb does. A little of the shower gel also goes a very long way which is always something I like in a Lush product. Since September I however have well and truly over indulged on Berry Berry, as has my husband. Just because a small amount of this shower gel goes a long way it doesn’t mean you can’t treat yourself to a little bit more than needed in the shower! I find its scent and how it feels on my skin so refreshing that I can never resist squeezing out an extra blop. It was the first of the Christmas shower gels to have an empty bottle in our house. Therefore I feel safe in saying that I think the Berry Berry Christmas shower gel is BERRY, BERRY good! 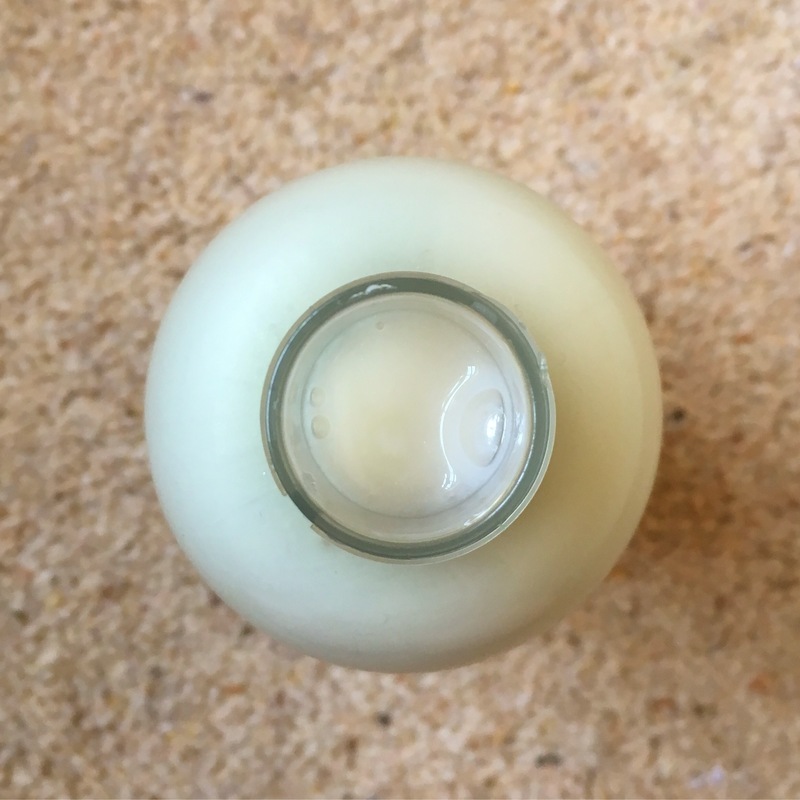 I believe that the Calacas Shower Gel was my very first shower gel purchased via the Lush Kitchen, why I have left it so long to review it is beyond me, as I LOVE the stuff, maybe even more than I do my husband. I know I throw the love word around a lot but Calacas is hands down one of my favourite Lush scents ever. If I hadn’t have ordered this shower gel back in the day I don’t think I’d have even got so into Lush. It’s divine. The Calacas scent is refreshing, uplifting and zingy. Lush have carefully combined oil of lime, neroli, cooling aloe vera and olibanum to make the most gorgeous and energising bath time treat in shower gel form. If you are in need of a boost, a quick shower with the Calacas shower gel will reinvigorate both your mind and body. It’s fruity but not like anything else you’ve tried before, some people describe it as smelling like fruit pastille sweets, I can see where they are coming from but it is so much better than that. 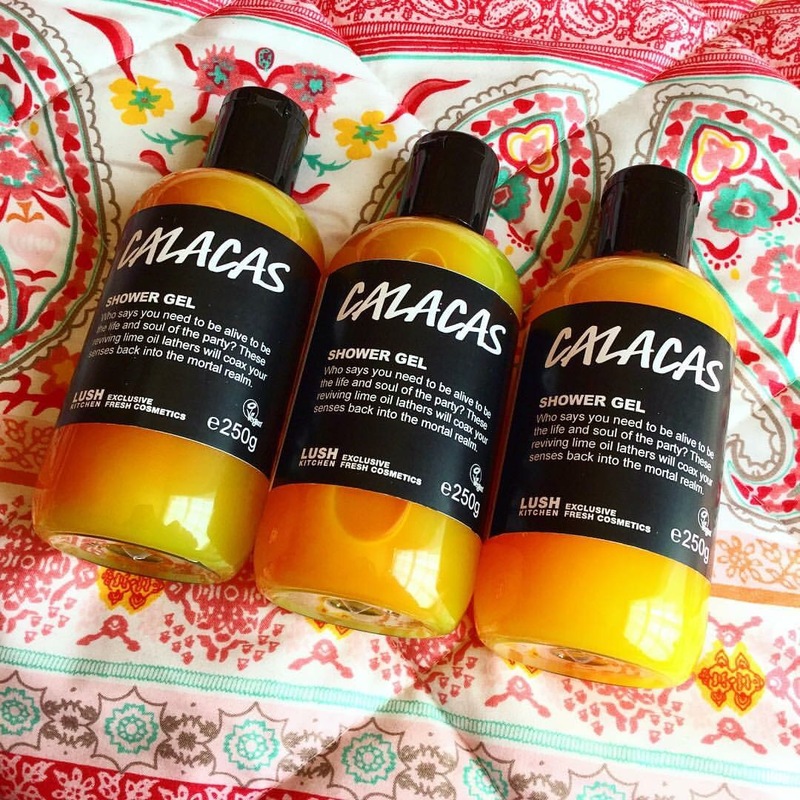 I am hoping that they decide to release the Calacas shower gel as a store product this Halloween, it has only been available in the Lush Kitchen on occasion for the last few years and I just don’t understand why something so beautiful isn’t readily available in stores. I’d love to see it as full time stock but even if they release it just for the Halloween period, that would make me a very happy Lushie. Another wonderful thing about the Calacas shower gel is how it looks, it has actually been available in the past as several different shades, red, green and a yellowish orange. For the purpose of this blog post I have included pictures of the orange version. I have never seen a shower gel like it, depending on how the sun catches it, it can look so many shades of orange, sometimes I even get a glimpse of it and think it is glowing. Consistency wise the Calacas shower gel is quite thick, I’d compare it to the likes of the Plum Rain shower gel which happens to be another fruity shower gel that I cannot get enough of. Calacas lathers up well, a little of it also goes a very long way which is great considering its consistency and even better when you take into account how rare it is. I was glad to see that for Halloween 2016 Lush decided to bring out a bath bomb with the Calacas scent called the Monsters’ Ball. I have my fingers crossed that this bath bomb returns again as the Calacas scent needs to be enjoyed by everyone! it is one of those scents that work brilliantly in any format. My favourite thing about the Calacas shower gel is how long its scent stays with you after use. Much like the Yuzu and Cocoa shower cream I can still smell it on my skin hours and hours after using it in the shower. I also have very fine hair and can get away with using Calacas shower gel as a shampoo every now and again. I am currently almost out of my latest batch of Calacas shower gel so if Lush aren’t bringing it out as a staple product for Halloween 2017 then I hope they bring it out in the Lush Kitchen again very, very soon. It’s a shower gel a Lushie should never be without! The Ghost Shower Gel was on my Lush-must-haves list for a very long time before I finally got my hands on a bottle. It wasn’t on my list for quite as long as the Celebrate shower gel was, it was however on there long enough for me to breathe a sigh of relief once my online order of it had gone through. The Ghost shower gel has a very gentle scent, on paper it isn’t actually a scent I would naturally gravitate towards as it is primarily floral. Be that as it may, my mind on its scent was soon changed after I had, had a sniff of my friends Moon on a Stick bath bomb, (it shares a scent with the Ghost shower gel). Without further a do, I quickly added everything Ghost scented on to my list of Lush-must-haves. The Ghost shower gel has a long list of floralesque ingredients; Jasmine, ylang ylang, dove orchid, rose water and one of my favourites neroli. Looking at this long list you’d expect this shower gel to smell like your nan’s handbag, yet it doesn’t. It has a really creamy scent, I have seen some people over Instagram comparing it to Dove soap. Ghost shower gels consistency reminds me of the So White shower gel. It needs a bit of a shake just before you use it. A lot of Lush’s shower gels need to have this done before use as the fresh ingredients used in them sometimes start to separate, this doesn’t mean that the product is going off it’s just the natural order of things when dealing with such fresh ingredients. Ghost takes a little longer to lather up than other Lush shower gels, I also find that I need to use a little more of the product than I am used to with this type of Lush product. This is by no means a negative point though as I normally use very little of the shower gels per shower, I’d say a good 80% of Lush shower gels are ones where a little amount goes a long way, even though I am using more of Ghost it still isn’t nearly as much as I’d use from other shower gel brands. 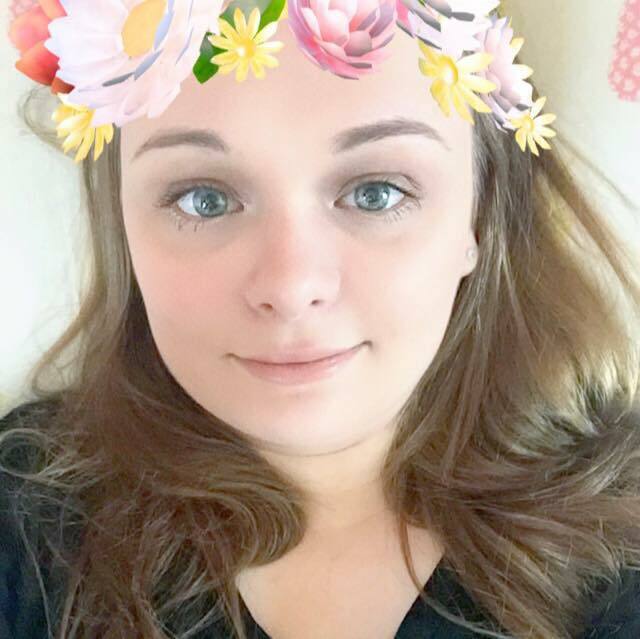 I was pleasantly surprised at how soft and hydrated Ghost shower gel left my skin, I don’t know why but I seem to always convince myself that floral products will dry my skin out. I think the inclusion of rose water in this shower gel has helped a lot when it comes down to your skin. This shower gel would be a great product to use whilst on a sunny holiday as I can imagine it being very soothing on the skin after a day in the sun. Ghost’s scent stays on your skin for a couple of hours after getting out of the bath/shower. I don’t dislike its scent, I just have other shower gels that I like more such a Hot Toddy, Twilight or Plum Rain. It is however a very good shower gel and it has opened up my senses, I am now eager to step out of my comfort zone and try other floral based products that I have avoided previously.